I originally wanted to go to cork and fin this particular night but it being close to Christmas they had a private event on; as I walked past I noticed L’Abattoir, a restaurant also on my list, I took it as a sign and found a seat at the bar ready for the ensuing meal. L’Abattoir sits in Gastown, It was a sleek and modern concept interior that was oddly isolating and warming at the same time, the ambiance was similar in concept to the menu which I found very reassuring, a contemporary and refined cooking and plating of homely yet machined dishes. 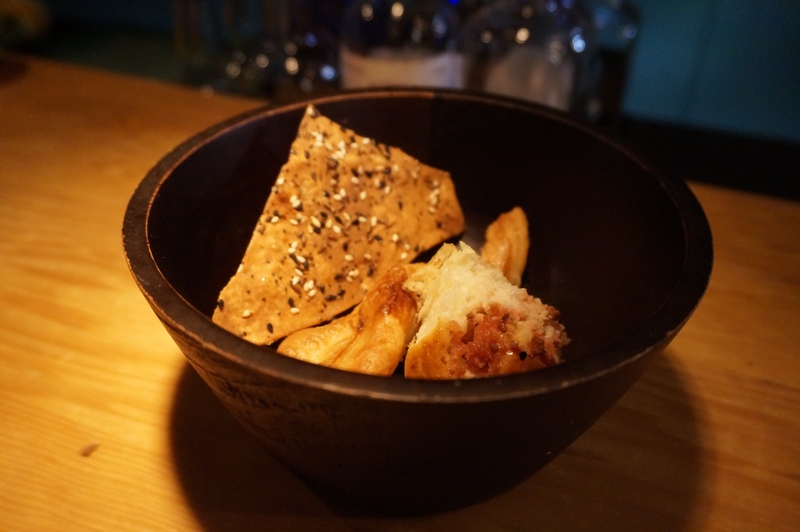 I was started off with a complimentary bread basket containing a bacon brioche, anchovy twist and a few pieces of sesame flatbread. Each one was house made and had great flavours I personally like the flatbread and obviously the bacon brioche; I wasn’t as big of a fan of the anchovy twist, it was a little dry and for me, overly salty. 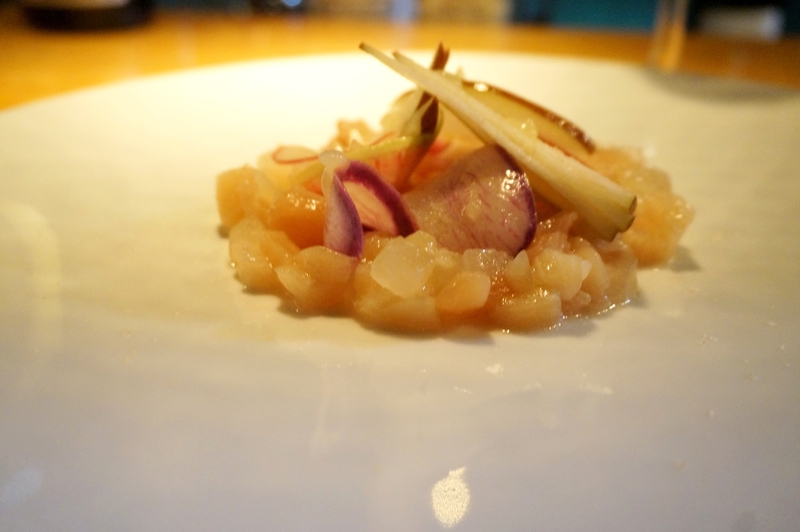 For dinner I decided to get an entrée and a main; to start I went with their yellowtail tartare, with pear, radish and citrus. It came out looking simple, nothing but what was listed on the menu. The fish so fresh it could have been alive when I walked in and was prepared as I ordered; coupling that with the sweet crisp pear and the slightly tart radish, it was a well-crafted and refreshing dish, the addition of citrus and oil leaving a great flavour and taste on the pallet. The main was a tougher choice, they had a duck dish, a beef dish and an Assiette of suckling pig dish. After flipping coins and talking the bartender I chose the Assiette of suckling pig. 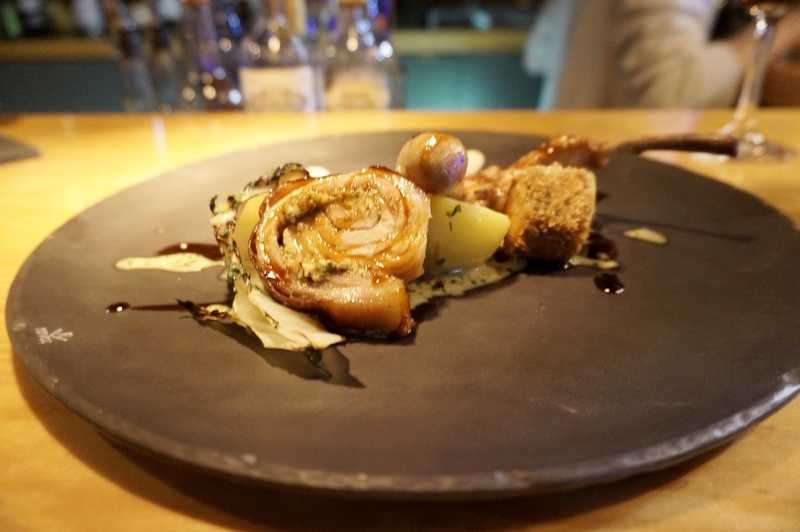 It was a great dish, a trio of pork, a sausage, a chop and a belly roulade. All three of the meats were cooked and flavoured to perfection; I was particularly impressed by the chop. The sauces were matched to each type of meat well and the potatoes were cooked to a perfect fluffy texture. I found it to be an overall satisfying dish but it was missing an element of fruit, in particular some sort of apple that would have tied everything together. I really loved the atmosphere and the overall experience and would definitely go back to try the duck if I’m ever in Vancouver again. Posted on May 20, 2016 by AdrielPosted in SteakLESS, VancouverTagged Canada, Gastown, Pork, Tartare, tuna, vancouver.